The best kids show that wasn't really for kids! I rediscovered them a few years ago and like them more than ever now that I understand all the jokes. 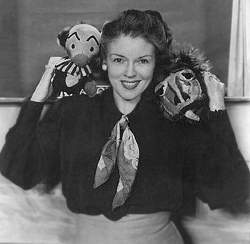 When I was a little girl I used to think Kukla was the most adorable thing. Most people like Ollie best, but not me. Puppeteer Burr Tillstrom's humor is clever, but not cruel and everyone always loves and respects one another at the end of the day. it is too bad more people don't follow his lead today, our entertainment would be much more palatable.